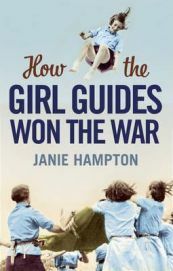 How the Girl Guides Won the War by Janie Hampton was a book I expected to be enjoyable but rather twee, full of sing songs around campfires and tales of irritatingly cheerful Girl Guides doing good deeds. How wrong I was. These things are all present in the book, but there is much more to it. My expectation was similar to that of the author before she started writing; in her introduction Hampton notes that she not expected to write the book she did, which is full of praise for the Guide movement. Founded in 1909 after girls took an interest in the recently formed Scouting movement, Girl Guides was something which was open to girls from all backgrounds around the world. Being a Guide gave girls instant friends and pastimes, and a sense of pride in their uniform and achievements. Guides performed good deeds, learnt useful skills and earned badges. Their younger counterparts, Brownies, did the same but suited to their age range, as did the Rangers and Sea Rangers beyond the Guides. Having already proved useful in World War I, when World War II broke out the Girl Guides around the world leapt into action. Some joined women’s military organisations, others stayed as Guides and continued with their good deeds and began working as messengers and telephonists. Outside the UK, Guides skills and positive attitude was called on in even more extreme circumstances, such as the resistance in Poland or in concentration camps in China and Europe. One word can really sum up my thoughts on How the Girl Guides Won the War: surprise. I didn’t expect to enjoy it as much as I did, or to be moved as much as I was. I certainly didn’t expect to feel pride at having been a Girl Guide myself, and therefore having had a connection to the Guides featured in the book. By the time I left Guides, it was very uncool and I was embarrassed to be a member. Now I find myself fondly remembering camp and badges (perhaps with a slightly rose tinted view). How the Girl Guides Won the War is a very moving book. Much of it is made up of stories about individual Guides around the world, and how they not only coped with the war, but how they did their bit. There is a bit of humour in some of the stories, particularly those in the UK, as of course the Guides followed their founder, Lord Baden-Powell’s, rule of always smiling, “and if you can’t smile – well – then grin!” The Guides took this to heart during the war, always keeping their spirits up. However, there are times when the book makes for difficult reading. Guides were very active in the Polish underground resistance, suffering through terrible hardships in order to help their fellow countrymen. Some who were caught by the Nazis paid the ultimate price. Guides, as a uniformed organisation, were seen as dangerous, along with the Scouts, but even in the face of danger they carried on, wearing their Guide badge under their lapel whilst working for the resistance or even when in concentration camps. There were even secret and silent Guide companies in the concentration camps, the girls and their leaders determined not to let the Nazis break their spirit. Hampton’s research for How the Girl Guides Won the War has been extensive and thorough. She has spoken to hundreds of women who were Guides during the war, and has pieced together their stories with the broader history of the war, and also of the Guiding movement. Each chapter focuses on a particular place, or a “feature” of the war, such as doodlebugs and blackouts. The Girl Guides may not have actually won the war as the title states, but they certainly played their part. We cannot answer whether it would have been won without them, but their part was not minor and they were greatly valued by all around them. How the Girl Guides Won the War really does make fantastic reading. Like me, you may expect a twee and overly cheerful account of running errands, but it is so much more than that. There are stories here of unbelievable courage and fortitude, of girls whose actions helped so many others, and they were only teenagers, or younger in some cases. How the Girl Guides Won the War truly moved me, and I feel proud to have been a member of the same organisation of these incredible girls and women. Many thanks to HarperCollins for providing a review copy of How the Girl Guides Won the War. 2 Comments on "How the Girl Guides Won the War"
Thanks Amy, glad the review was helpful and I’m sure your mum will like the book!